A charity worker received a note requesting that he stop parking his van on a wealthy Edinburgh street because it "lowered the tone of the area." 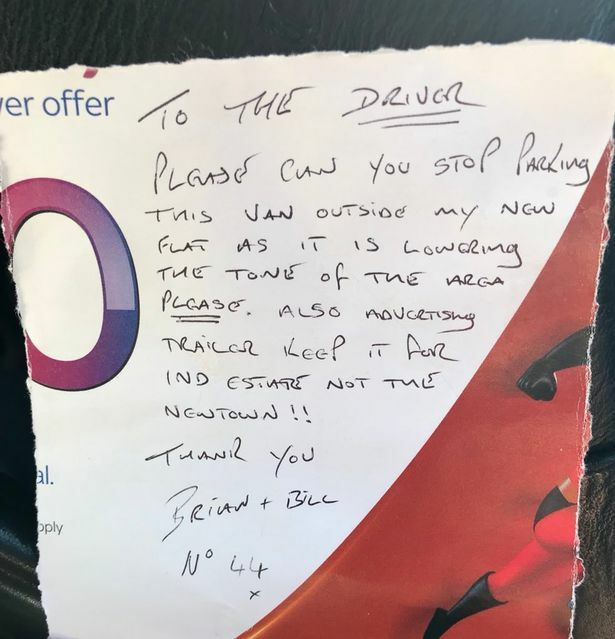 Bradley Walsh, who organises free boxing classes for underprivileged kids, found the snooty letter stuck to the side of his van which was parked on Drumsheugh Gardens, an upmarket area in the west of the city. It read: "To the driver, please can you stop parking this van outside my new flat as it is lowering the tone of the area please." "Also advertising trailer. Keep it for ind. Estate, not the Newtown. Thank you." The letter was signed by "Brian and Bill", two residents believed to live in a posh, multi-million pound townhouse on a nearby street. The van and trailer promotes voluntary organisation Edinburgh Helping Hands, and includes Trainspotting novelist Irvine Welsh as one of its supporters. Bradley posted a photograph of the note on his Holyrood Boxing Gym Facebook page, writing: "After six weeks of relentless work, it's always nice to be reminded that you are doing good..."
"I've offered to help Brian and Bill buy a castle with private grounds to keep the peasants out of sight. Juliette Jones wrote: "Brian and Bill being are snobs and also missing the point of advertising." Another follower, known as Bruce Wayne said: "'Lowering the tone"....absolute pair of ****." Tristan Price Williams wrote: "Bet they wish they hadn't done that. W ***** s!" "The fact he's been tagged into this I'm sure embarrasses him and lets face it Brian didn't give a s*** about Bill when it was 'my new flat'." Irvine Welsh himself joined in, joking: "Rumours that I'm Brian are totally unfounded. Irvine Welsh aka Bill. Bradley Welsh revealed he now lives about "25 paces" away from Brian and Bill on Chester Street, although he doesn't know them. Bradley, whose football casual past resulted in him serving jail time and who used boxing to transform his life, added: "I put up the post to shine a light on what some people are like. "This is Edinburgh. I think the post resonates with people. There's an upper class and a working class and the divide is very much there. "Anyone with a brain can see the difference between rich and poor. "You would think they would read the side of the side of the trailer, or look up the organisation and see what we do. "Who would have the audacity to do that?" . "I'll just keep doing what I'm doing, providing opportunities for kids in the area."